What? Going to take a while? Slowing down a bit? Just a at someone who comments on my speed. It's looking good kvom. I'm following along and learning things. I didn't realize how big that engine is till seeing it with the collet block. Very nice! For the brass parts like that, doing a stress relieving heat in the oven first would prevent that. Put the bars, degreased, before machining, in the oven at 500f for an hour and let it cool, thats it. Makes a huge difference in how it curves when cut. I try to load up all the bars for a project at once to limit how many times I have to run the oven like that, especially in the summer. Fitted the valve lifters and threaded the drill rod to hold them in place. 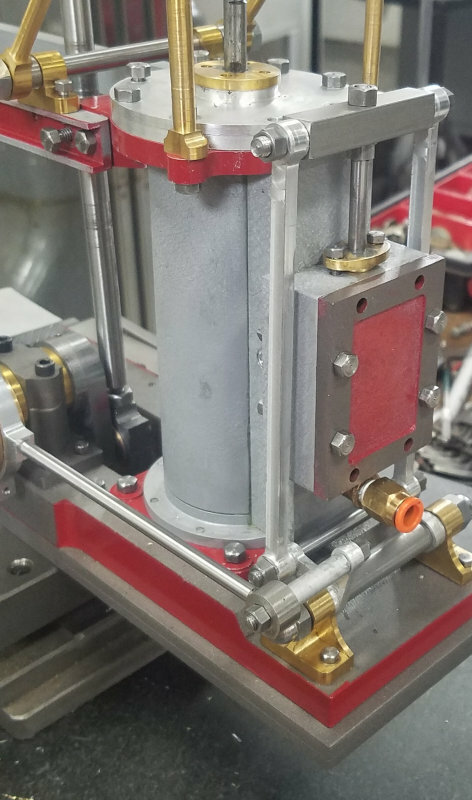 The valve movement as the eccentric turns is quite smooth, a nice surprise. When I removed the cover to observe the valve it's off center. It seems that I may need some more threads on the valve rod or thinner adjustment nuts. That's for next time in the shop. In the last photo you can see the heads of two screws just peeking out from the flange of the port block. The 4 holes on the sides of the steam chest are through tapped, so that the steam chest remains attached with the cover removed. The other 4 holes in the steam chest are not tapped. I don't have any screws long enough at present, and in any case I intend to make studs for all 8 holes. I was able to get the flywheel mounted using some .002" shim stock, but it is temporary as Chuck is sending me his Sanderson casting. It is much closer to the type that would have been used on this type of engine and as drawn by Julius. I'll probably need to remake the crankshaft to fit it properly. Yesterday I finished 3 of the studs for the steam chest cover, so today I'll finish the other 5 and start thinking about the base. Other todos: powdercoat the valve lifters and the structural rods, plus finish the pump. The governor as drawn will be a challenge, esp, its brackets, and I'll need to source some small bevel gears. It's a beauty. I love the action. Very nice! I'm with Zee - love that action, and the slow motion! I second liking the slower speed, can view all the parts in motion a bit better. Beautiful job. Wonderful motion and sound - congrats! I finished the steam cover studs and ran it again with a pressure gauge. The speed in the video is at about 20 psi, and it runs well at 15. Congratulations for this runner Kirk. A little experiment in masonry. I powder coated a small piece of aluminum orange and then machined grout lines into it. The CAM programming was in error, but at least the effect can be seen. Bricks on my house are 7x2" with 1/2" grout. I decided a 1:8 scale would be appropriate to the engine, so the grout would be cut with a 1/16" endmill. 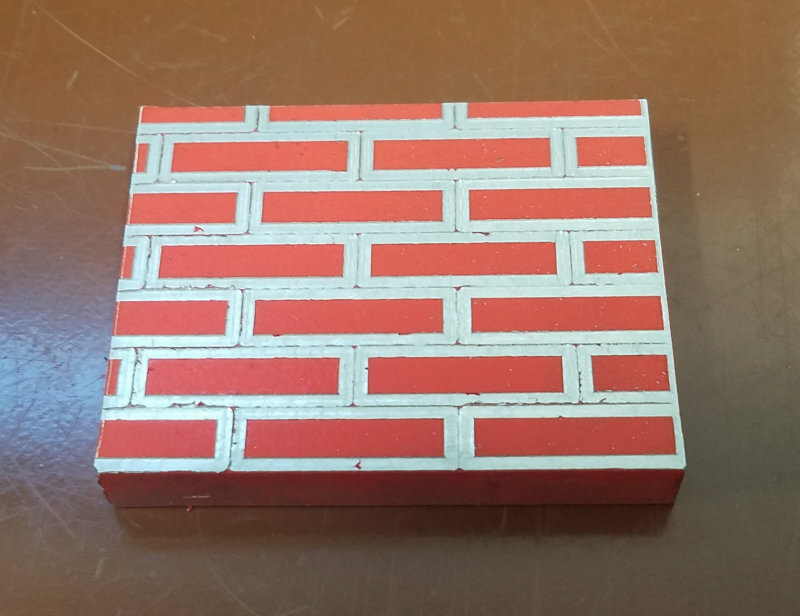 The pattern was generated in Solidworks using a 2 brick sketch expanded as a linear sketch pattern in 2 dimensions, so any size wall can be generated easily. At 4000 rpm and .006 DOC the recommended feed rate is 4 ipm, so a big wall would take a long time. This will be a good change to try out my hi-speed spindle attachment that goes to 30K rpm. All will have to wait until I get the flywheel and can design the base. Bad Behavior has blocked 16672 access attempts in the last 7 days.